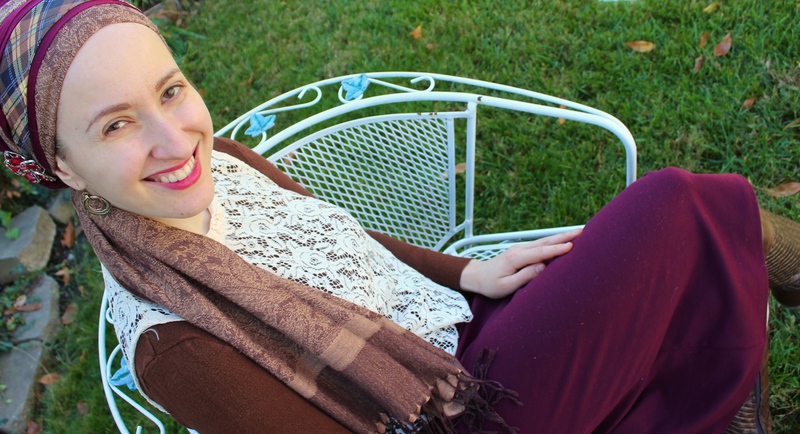 Maybe it happened in a dream, but I seriously remember doing a post about burgundy and brown in a past post! Didn’t I? Well, since I can’t find it, I’ll just have to do it again! My family had a crazzzzy wacko day. It started off with my phone refusing to work so I couldn’t do my scheduled calls/meetings, then became a day that we needed to take off our regular work schedules because my husband is in search of a better violin (if anyone has gone through this process you can imagine how much more time consuming it is; we were prepared for this, but not prepared for how much more time consuming it is when you’re no longer a student and have a baby), then lo and behold my husband’s phone decided to also go loco while in the suburbs of DC and we got majorly lost, only to get back on track, charge phone, go to the violin dealerships (Shalomy loved it!) and then have his phone fizz out again in the middle of an unfamiliar neighborhood in Baltimore. We just got back home at 10pm with new phones thank Gd, both of us wondering at what Hashem was trying to teach us during this odd, obstacle-y, ironic, fun, and gratitude-filled day. Your friend Naomi did a raspberry and chocolate post, I think. 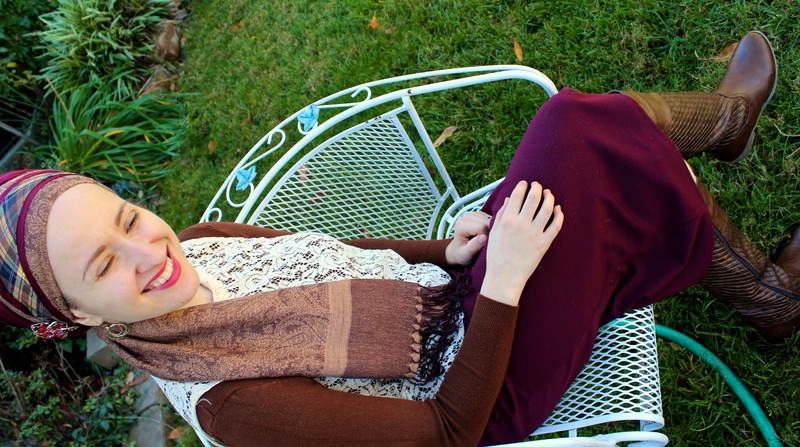 I love the combination,and need that burgandy 2 in 1 myself! , what am I going to do I’m engaged to an amazing man in London England and I’ve always then a woman who wore scarves on my head and when you came to Detroit you did wrap my head in front of everybody else it was great, but this wonderful gentleman had a wonderful wife who passed away from cancer and she had to wear scarves and he kind of told me in a nice way you would rather me only wear. Sheitail .I must have at least 2 300 scarves I mean I love my life matching it is obsession. I’m a florist and I have to be perfect I find myself in the most interesting situation because I just don’t know what to do. Yes!!! Because we were talking about it – that’s what I remembered! Thanks! We have a Mario Frosali Violin, but it is worth 10-20 k, so lovely husband probably wouldn’t want it. It was bought by my FIL in 1926, we have all of the original paperwork. Maybe your husband could tell us where we could get a new appraisal on it? You shine in every picture. I love it. 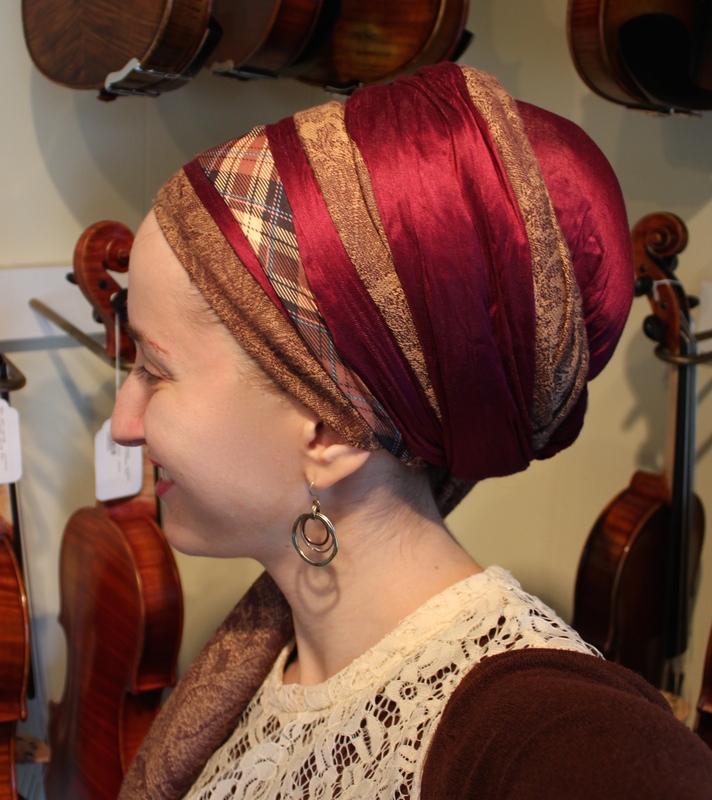 remember the post “my tichel matches my….cello” right away this wrap reminded me of that one.